I’m sure I’m not alone in occasionally thinking I’m just not ‘edgy’ enough to be a ‘fashion’ blogger. This is why I will never claim to be one I guess huh?! My style is way to cutesy and ironic to be edgy, but sometimes I succumb to complete hype, as proven by my last outfit of the day blog post! Studs, pleather, collars galore that one. Anyway I was on this here internet and was sent the link to Javelin Online. Javelin Online stems from a little chain of 3 reasonably priced shops which stock an array of designers and fashion and these are my faves, in an attempt at being ‘edgy’…. 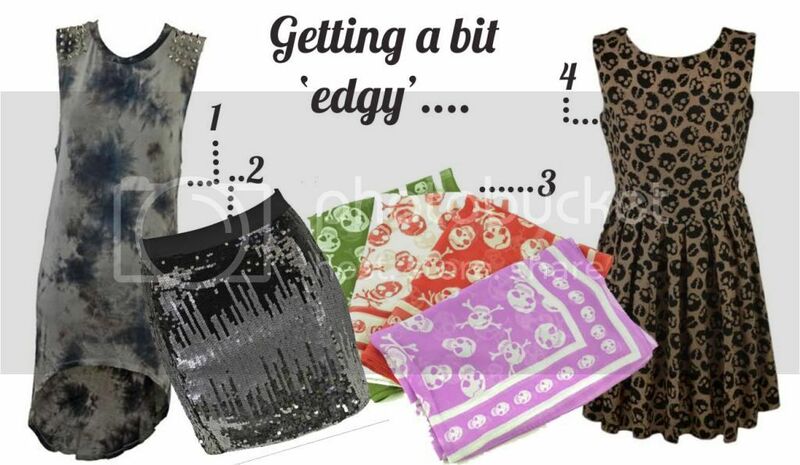 I think we can agree I’ve ticked the boxes for ‘on trend’ this season, complete with tie dye, studs AND SKULLS. I love this dress! It almost looks like leopard print if you squint and the lovely mushroom colour is perfect for the autumn, I’m not too sure about the sequins on that skirt but the ombre effect of them is delicious. Dontchya think? Previous Post Budget Hair Oil? Oh Go On Then….